Here is one project I have made. This is standard TS-808 with low frequency cut-canceling switch and 3 position switch for diode mods. 2d: 8 soviet germanium diodes. number 8 is taken to make overdrive threshold be around the same with original mode. 3d: asymmetrical clipping with 1n914 on one side and 1n914 with Schottky diode on another. Schottky diode has much smaller voltage drop compare to 1n914 which makes asymmetry not so large but still adding musicality to the tone. FET switching bypass was replaced for more simple true bypass. Audiophile operational amplifier opa2134 on board with good soviet ceramic capacitors. On such a high level of sound quality power supply for operational amp can make big difference. Here I use LowZ electrolytic capacitors Hitano ESX in parallel with film capacitor to filter high frequencies for opa2134. As result we get much more clear response then original pedal. 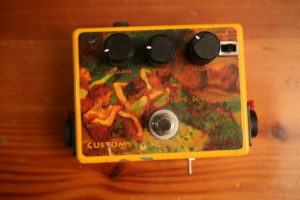 And possibility to choose different diode options make this pedal more versatile.